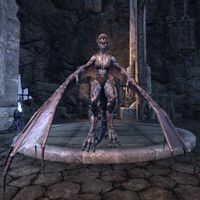 Drasilla is a Winged Twilight who rules over the Spurned Peak. She is obsessively infatuated with Stibbons who she found and has captured him within the tower. As you approach her she will cry out "No! Stibbons is mine! You won't take him from me!" before attacking. Prior to Update 10, Drasilla had 20828 health, which was later changed to 40267 health, and she was level 46. After Update 12, this was changed to 127470. This page was last modified on 25 January 2019, at 16:15.